Whether or not we would like to admit it or not, Christmas is going to be here before we know it and I have the perfect opportunity to save some money on your Christmas cards, or if you prefer - Holiday cards. 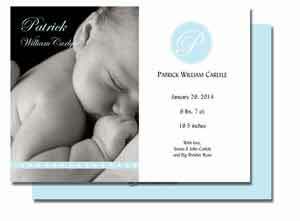 Cards Direct offers the very best in personalized greeting cards for business or personal use. Over 2,000 card designs are available in categories that include holiday cards, birthday cards, thank you cards, photo cards, baby shower invitations, birth announcements and many more! With free personalization and custom imprinted verse, CardsDirect offers an easy online ordering process and top quality cards with the best selection, customer service and pricing found anywhere. I think what I'm going to order is some Baby Announcements - my friend's daughter is supposed to have her first baby in the next two weeks and Cards Direct has some really cute designs! I think this is THE CUTEST birth announcement EVER - don't you?! It's so darling! This giveaway is open to US Residents aged 18 and over (sorry Canadian residents!) This giveaway will end on 10/12. Disclaimer: I was sent 50 cards from Csrds Direct to facilitate in this review. The opinions expressed above are solely my own and yours may differ. Receiving a product will NEVER influence what I write in any review. I would love to get graduation Thank you cards for my daughters graduation this year! I like the Black Simple Thank You cards. I would also like Birth Announcement cards since we are expecting in Dec. I would like to order some graduation thank you cards for my son who is graduating next year. I would get Christmas cards - specifically the Sparkling Snowflake Greetings. I love the Soft Spoken Word Christmas cards. I would definitely order those. I entered the Smart Balance giveaway.